One-Third of Businesses have Suffered Six-Plus Breaches in the Past Year. Learn How to Avoid their Fate. No organization is immune from cyberattacks. According to the 2019 Cyberthreat Defense Report, a whopping eight of 10 surveyed organizations admit to at least one breach in the past year, while one-third admit to 6 or more successful cyberattacks in the same time frame. 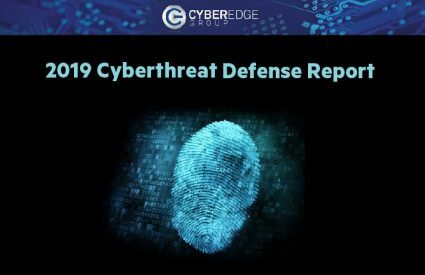 With exclusive findings like these, the CyberEdge Group’s sixth annual Report provides a penetrating, essential look at how IT security professionals perceive cyberthreats, and how they plan to defend against them. Process insecurities. Secure application development and testing is the security process organizations struggle with the most, followed by detection of insider attacks. Powerful pairing. Security analytics join threat intelligence services as top security management and operations technologies planned for acquisition in 2019. Bringing the heat. More than four in five respondents believe machine learning and artificial intelligence technologies are making a difference in the battle to detect advanced cyberthreats. Under pressure. At the same time that more than four in five organizations (84.2%) are experiencing a shortfall of skilled IT security personnel, security teams are struggling to deal with a growing mountain of security data. The Report provides tech and business decision-makers important information on the threats their competitors and peers are facing, and how they are reacting to them. This can help guide how you deploy and invest in security for your business. Get your free copy of the Cyberthreat Defense Report 2019 courtesy of Imperva.